PERU, Ind. (AP) — Some business owners in a northern Indiana city are worried that a months-long bridge closure could hurt their bottom lines. 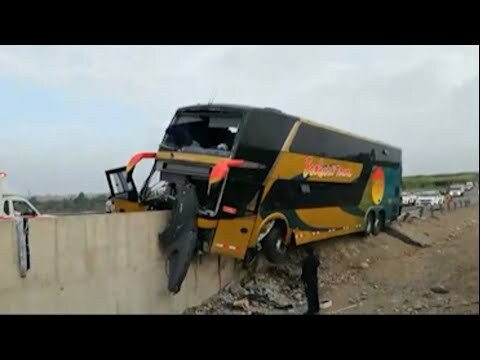 LIMA, Peru (AP) — Authorities say at least 20 people were killed when a fire broke out in a bus at an informal stop on the northern outskirts of Peru's capital. LIMA, Peru (AP) — Peru is taking a new approach to combating rampant illegal mining that threatens the delicate Amazon rainforest: Send in the military. ORLANDO, Fla. (AP) — A Florida firefighter fired for a positive drug test got his job back after arguing the cocaine in his system was from a tea made with coca leaves. PERU, Ind. (AP) — Schneider Electric says it will close a factory in northern Indiana, affecting 306 workers. Mayor Gabe Greer says the closing of Schneider's Square D site will have a "huge impact" on Peru. The company has cut more than 120 jobs since 2017. LIMA, Peru (AP) — A hotel wall collapsed during a wedding celebration in Peru, killing at least 15 people on Sunday, authorities said. The United States and all but one member of the Lima Group of regional nations threw their support behind Guaido after he declared himself interim president in a defiant speech before masses of anti-government demonstrators. Former President Pedro Pablo Kuczynski pardoned Fujimori on humanitarian grounds in 2017 in what many saw as an attempt to stave off impeachment by courting Fujimori's allies in Congress. LIMA, Peru (AP) — A year ago, Venezuelan migrant Reymar Perdomo was singing for spare change on jammed buses, struggling to make ends meet while building a new life in Peru's capital. LIMA, Peru (AP) — Peru's attorney general resigned on Tuesday amid accusations that he hindered a corruption probe involving Brazilian construction giant Odebrecht. LIMA, Peru (AP) — Peru's attorney general said he will present his resignation on Tuesday amid calls for him to step down for allegedly hindering a sweeping corruption probe involving Brazilian mega-builder Odebrecht. RIO DE JANEIRO (AP) — A powerful earthquake has shaken northwestern Brazil near its border with Peru, affecting a remote part of the Amazon rainforest. There were no immediate reports of damages.